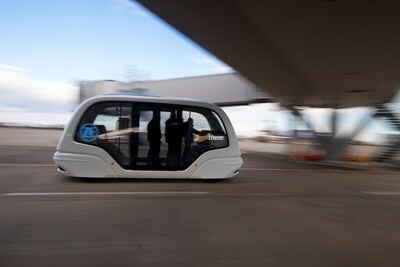 FRIEDRICHSHAFEN, Germany and UTRECHT, Netherlands, March 19, 2019 /PRNewswire/ -- ZF Friedrichshafen AG has acquired a 60 percent share of 2getthere B.V. The company offers complete automated transport systems and is located in Utrecht/Netherlands, with offices in San Francisco, Dubai and Singapore. Applications range from driverless electric transport systems at airports, business and theme parks to dedicated urban transport infrastructures. With this strategic investment, ZF is executing its Next Generation Mobility strategy to strengthen its foothold in the Mobility-as-a-Service and automated guided vehicle growth markets, complementing its existing activities. With this strategic investment, ZF is strengthening its position in the growth markets of Mobility-as-a-Service solutions, autonomous transport systems, and shared autonomous vehicles. The majority stake in 2getthere complements ZF's existing investments and co-operations, such as the e.GO Moove, a joint venture with e.GO Mobile AG, which targets the production of the e.GO Mover autonomous minibus, as well as Transdev, a leading operator andglobal provider of integrated mobility solutions. For further press information and photos, please visit: www.2getthere.eu.